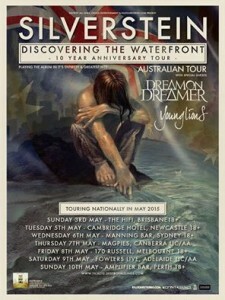 To celebrate such an important milestone, Silverstein will be playing Discovering The Waterfront in full along with their greatest hits to their Australian fans this May. And with new album I Am Alive In Everything I Touch scheduled for release around the time of the tour, fans can expect some brand new inspiring material to go along with the classics. Joining Silverstein are Melbourne DIY metalcore machines, Dream On Dreamer whose marriage of aggression and ‘fond sentimentality’ has given them a unique and envious position in the scene. Over the last two years they have literally played the globe twice over, sharing stages with the worlds biggest bands and released a catalogue of material bands twice their age have yet to manage. Brisbane’s Young Lions formed in 2013 and have a touring schedule that puts many to shame. Relentless in their approach, the band have supported major internationals, Australian heavyweights and headlined their own tours. Their latest album, Blue Isla, was fully crowd funded and they are on the verge of joining the illustrious Australian elite themselves. Get in early for tickets to experience Silverstein like its 2005 all over again! Tickets on sale 23rd January at 9am!